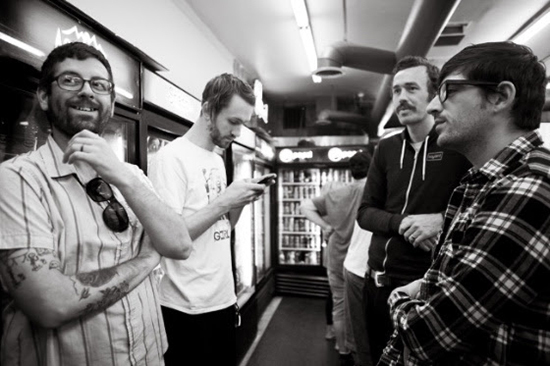 Phoenix, Arizona garbage pop veterans AJJ (formerly Andrew Jackson Jihad) are coming to Canberra this September, armed with their unique collection of scuzzy punk screeds. Since touring Australia with The Smith Street Band in 2015 they’ve released their sixth album The Bible 2 out through SideOneDummy Records. They’ll be stopping by Transit Bar on Saturday September 30. Tickets go on sale Wednesday July 19 at 9am through poolhouserecords.com.au. Supports will be announced soon. The album’s mantra is placed at the centre: “No More Shame, No More Fear, No More Dread”. The Bible 2 finds the band choosing intimacy over isolation, gravity over the vacuum, the stage instead of the scene. Album opener ‘Cody’s Theme’ rings like Jay Reatard distorted with Neutral Milk Hotel neuroses (“I set the mommy on fire / I set the baby on fire / not even Jesus could stop me”). Singer Sean Bonnette’s narrative skills, and the band’s growing nuances have never been more heartbreaking than on ‘Junkie Church’, a tender acoustic tale about affection and companionship on the lowest rung of society (“I used your rubs as ladders / and I climbed up your chest / and I jumped up and down just like a trampoline” Bonnett sings). The band’s synth, cello and bass are employed to haunting Leonard Cohen-like production ends, staccato plucks and serrated chords hiving like gnats then quickly dissolving into darkness. Former touring partner Wil Wagner from The Smith Street Band recently said, “Sean might be my favourite living lyricist and we’re all lucky to have his songs in our lives. His songs get better and more polished every album but still maintain all the weird beautiful qualities that made me fall in love ten years ago”. Playing the already announced and sold-out Yours & Owls Festival in Wollongong alongside At The Drive In, AJJ have announced a huge Australian tour, taking in most capital cities and a big chunk of regional areas.